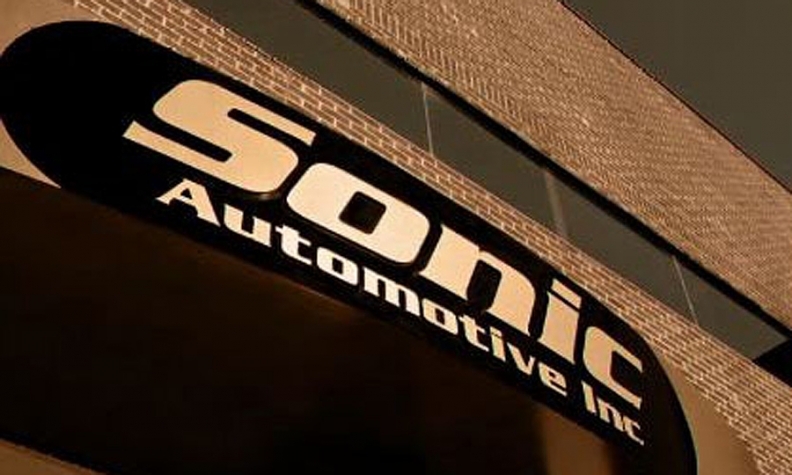 Sonic Automotive’s adjusted net income fell 45 percent in the second quarter, partly because of rising expenses related to the launch of the retailer’s EchoPark stand-alone used-car stores, the company said today. New-vehicle sales and new-vehicle revenue also fell. Adjusted net income slumped to $14.8 million in the quarter, as revenue rose 3 percent to $2.42 billion. Sonic was hit with $3 million in damage on three of its stores in Denver following two hail storms. “We got hit, repaired the cars and got hit again 10 days later,” Sonic President Scott Smith told Automotive News. Smith said Sonic also took a charge for surrendering a Chevrolet franchise in Denver. It then moved its nearby BMW store into that space and took a write-off for the goodwill and facilities that would not be used by the BMW dealership. Sonic’s total impairment charges were $10.5 million vs. just $4,000 in the year-earlier period. The slight bump in revenue came as Sonic achieved its goal to sell an average of 100 used cars per store per month for the quarter. Sonic also saw gains in its fixed operations. F&I gross profit per unit on a same-store basis rose 4.6 percent to $1,274. Sonic said its EchoPark stores sold 881 vehicles in the second quarter, up 221 vehicles from the prior quarter. Sonic’s used-vehicle retail sales from continuing operations for the quarter rose 6.3 percent to 30,301, while its wholesale used-vehicle sales rose 3.5 percent to 8,010. Sonic reported pretax expenses for EchoPark of $4.1 million, up from $3.2 million a year earlier. Smith said the rise in expenses primarily reflected additional personnel. The three EchoPark stores in the Denver area employ about 300 people, vs. about 25 a year earlier, when the stores hadn’t yet opened. As Sonic opens more EchoPark stores around Denver, it can lower costs by gaining economies of scale, he said. It plans to open two more EchoPark stores in Colorado this year and two more next, for a total of seven stores. On a continuing operations basis, Sonic’s net fell 44 percent to $15.1 million. Losses from discontinued operations widened to $311,000 from $68,000 a year earlier. Also on a continuing-operations basis, Sonic’s new-vehicle sales dropped less than 1 percent to 34,676 units for the quarter. In contrast, overall U.S. new-vehicle sales rose 3.3 percent. Revenue from new-vehicle sales fell 0.3 percent to $1.3 billion. Gross profit per new vehicle fell 9.1 percent to $1,925. The bulk of that $192 decline was from sales of Honda, Toyota and BMW vehicles, Smith said. BMW accounts for 30 percent of Sonic’s profits, Smith said. Toyota and Honda brands are a close second to BMW so, “if we do anything with those brands, it’s going to affect our numbers,” Smith said. Some of the decline for those brands came from inventory shortages. But the auto retailer also eased back on its pricing to move volume. Sonic’s overall gross profit in fixed operations -- also known as parts, service and collision repair -- rose 6.5 percent to $170.2 million on a 5.2 percent gain in revenue. On a same-store basis, fixed operations’ gross profit rose 8.5 percent to $167.8 million. Sonic, of Charlotte, N.C., ranks No. 5 on the Automotive News list of the top 150 dealership groups in the U.S., with retail sales of 135,932 new vehicles in 2014. Sonic completed launches of its used-vehicle business, EchoPark, and One Sonic-One Experience late last year. It introduced One-Sonic, One-Experience last summer at a dealership in Charlotte and then rolled it out to four more Charlotte stores in the fourth quarter. The nationwide rollout is expected to take all of this year and next, the company said. One Sonic-One Experience offers no-haggle pricing and has a goal of completing a purchase in 45 minutes or less with one sales rep using an iPad. Sonic is betting that by eliminating car-buying pain points, it will become a preferred place to shop and thereby gain market share. Sonic plans to implement One Sonic-One Experience companywide in about 36 months. The company also launched EchoPark. Sonic started by opening two neighborhood stores and a hub in the Denver area in 2014. EchoPark will feature a large hub store in each market with smaller neighborhood stores nearby. In the fourth quarter, Sonic will launch an EchoPark store in Dakota Ridge, near Denver. Another location is scheduled to launch in the Denver area during the second quarter of 2016. Sonic ended the quarter with $277 million in liquidity, up from $250 million a year earlier. Smith said the auto retailer is open to acquisitions but is being very selective because of other capital expenses such as expanding the One Sonic-One Experience initiative and EchoPark. Sonic plans to take EchoPark to a second, unidentified market outside Colorado. It plans to start building in that market in early 2016 and eventually have 10 to 13 stores there.